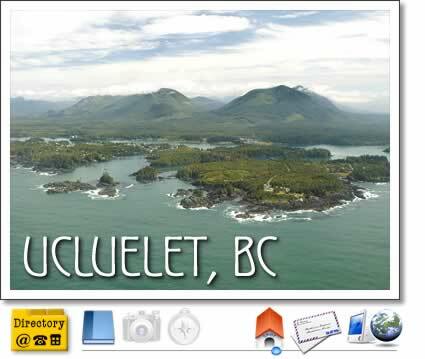 Ucluelet is a small village of approximately 2000 people located 41 km south of Tofino. Situated on the Southern tip of the Ucluth Peninsula on the westcoast of Vancouver Island, Ucluelet (pronounced you-clue-e-let) is locally referred to most often as 'Ukee'. Barkley Sound is a triangle covering over 100 square km, it is a vast area of rugged wilderness teeming with wildlife. It stretches from Ucluelet to the North, Port Alberni to the East, Bamfield to the south and the great Pacific Ocean to the west.This area features long winding inlets and rugged headlands, secluded islands, beaches and sandy coves, pristine lakes surrounded by ancient trees, everything that is unique to the west coast can be found here. These islands are mainly protected behind outer islands and reefs, ideal conditions for calm waters, tranquil sandy coves, rugged shorelines and an astonishing variety of wildlife such as migrating Grey, Humpback and Killer whales, and porpoises, seals, sea lions, and elephant seals. Ucluelet, also known as 'Ukee' is a village 41km south of Tofino, on the Southern tip of the Ucluth Peninsula on the West coast of Vancouver Island.